If you are looking for a relatively affordable, large, and powerful party/tailgate Bluetooth speaker, you should definitely check out ION Audio Road Warrior. This monster speaker delivers incredibly loud sound and crazy bass. It also has some nice additional features like an FM tuner, mic input, USB powerbank port, and 12V DC input. We’ve already mentioned ION Audio Road Warrior in our previous article on 10 Loudest Bluetooth Speakers. ION Audio is a not a big name in the audio industry but they are getting bigger every day. The company was established in 2002. They manufacture audio equipment, mostly Bluetooth speakers and turntables. They also make lighting and conversion equipment. 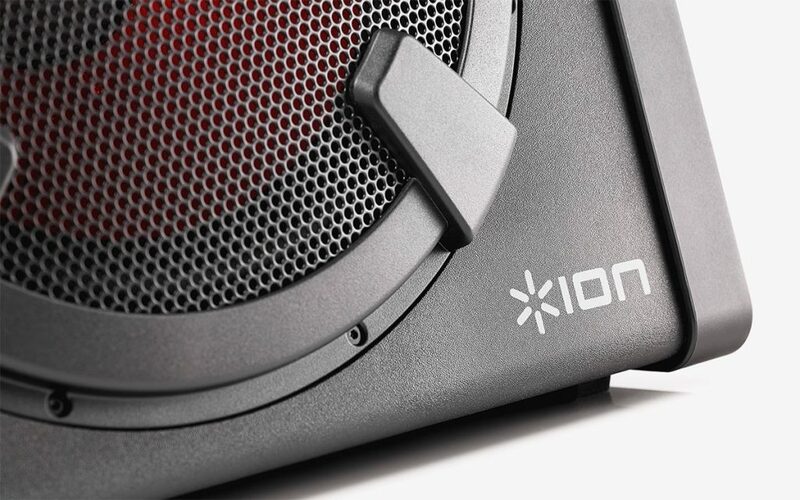 All ION Bluetooth speakers have a recognizable design – they are all large and rugged. Most of these speakers are designed for outdoor use. 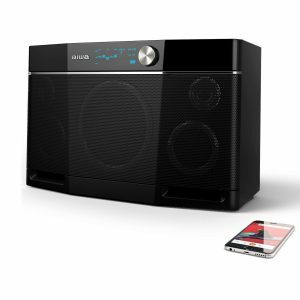 We are presenting to you one of the largest and most powerful ION Audio Bluetooth speakers called Road Warrior. If you are looking for a powerful but relatively cheap party/tailgate speaker, ION Audio Road Warrior is one of the best options. Road Warrior comes in a huge and very heavy box. The whole package weighs more than 30 pounds so you might need some help to take it out of the box. Besides the speaker, you will get one auxiliary audio cable (3.5mm to 3.5mm), AC power cable, DC power cable (car adapter), user manual, and 1-year warranty card. As we have already said, you could easily recognize any ION speaker. They are all large and very rugged. Road Warrior is huge – it’s probably one of the largest and heaviest portable Bluetooth speakers on the market. It’s kind of boxy with a slightly angled front panel for better sound dispersion. On the front panel, you will see two massive 10-inch woofers and two 1-inch tweeters. They are all covered with a transparent aluminum grille. Right in the middle, between two large woofers, there’s a circular control panel with an LCD display. 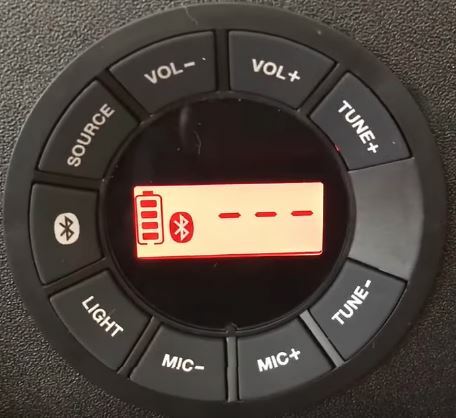 There are 9 control buttons – Bluetooth (for pairing), source (for shifting between FM radio, Bluetooth, microphone, and AUX input), 2 volume buttons, 2 tuning buttons (you can use them in FM mode), 2 mic volume buttons, and LIGHT button (woofers are lighted and you can use this button to turn on/off the lights). The LCD display shows battery status, selected source, and FM frequency. On the left and right sides, there are large handles for transportation. It’s not like you can grab it and carry it around like some small JBL or UE Bluetooth speaker, but those handles actually make things much easier. Road Warrior has ported enclosure. Two bass reflex ports are located on the rear panel. Most of the inputs are also located on the back. You have one 3.5mm input, one mic input, DC input (for powering the speaker via your car battery), AC input, and ON/OFF switch. On the top panel, there are USB powerbank port (you can use it to charge your phone or any other device that can be charged via USB port), NFC logo for quick pairing (only Android users can use this feature), rubberized FM antenna, and a pocket where you can leave your phone. ION Audio Road Warrior looks like a proper party speaker, especially at night when you turn on the lights. Those lighted woofers can really set the mood for your party. Considering the purpose, the only thing that should be better is the build quality. The enclosure feels strong and durable but the speaker is not waterproof. It’s not even splash proof. Some rubber/silicone wrappings and reinforcements and different input arrangement (relocation of the USB input) would make this speaker at least splash proof. On the other hand, that would additionally increase the weight and make this speaker less portable. 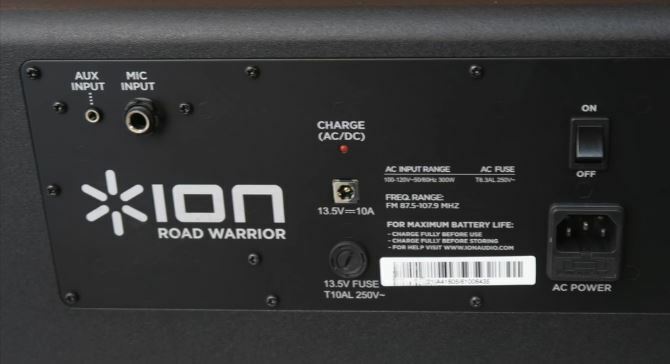 Road Warrior features powerful 7Ah lead-acid battery. The advertised playtime is 12 hours at 50% volume (4-5 hours at full volume). The battery capacity is quite amazing but there are some important performance issues we are going to discuss in the next section. Thanks to such a large battery, it was possible to install a USB powerbank port that you can use to charge your phone battery (you can fully charge iPhone 8 battery 4 times, or iPhone X battery twice). The speaker also has two charging/power inputs – AC and DC input. AC input is pretty much standard and you can find it on many large Bluetooth speakers but what really makes Road Warrior special is that 12V DC input. The speaker comes with a car charging adapter so you can charge and power the speaker through your car power outlet. This little feature makes ION Audio Road Warrior the perfect choice for tailgating. Road Warrior can be connected to your phone and other audio sources via Bluetooth or AUX (3.5mm) input. The only supported Bluetooth profile is A2DP (Advanced Audio Distribution Profile). 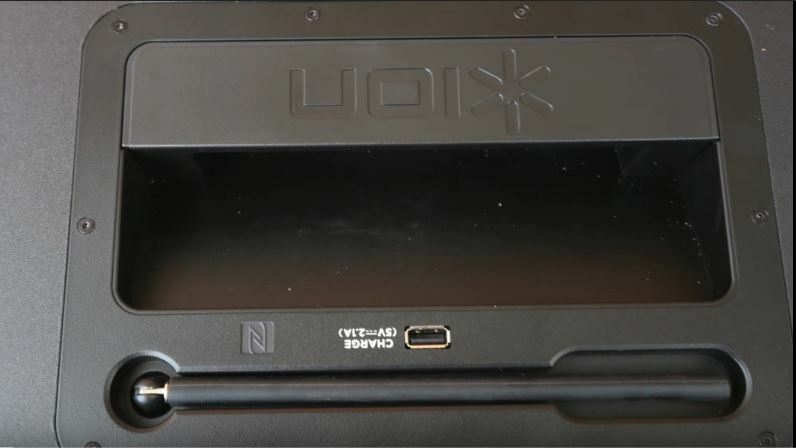 Road Warrior also features NFC (Near Field Communication) for fast pairing and if you have NFC-enabled Android device (phone or tablet), you can pair it with the speaker by taping the NFC logo on the top panel. The speaker also has one mic input (1/8 inch) so you can buy some nice microphone (not included) and throw a karaoke party if you want to. What this speaker doesn’t have is the RCA input. 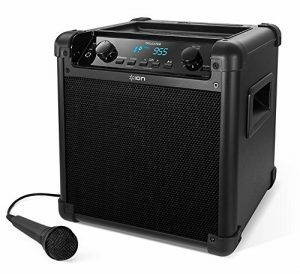 If you are trying to make a career as a DJ, and you need some cheap but powerful party speaker for your gigs, Road Warrior is not the best choice. Since it doesn’t have RCA inputs, you won’t be able to connect your turntable. Another additional feature is the built-in FM tuner. It’s not absolutely necessary but it could come in handy. We don’t have any major complaints regarding the connectivity. The Bluetooth works without issues. The range is shorter than the advertised (100ft) but that’s normal. Any obstacle shortens the range. Also, devices interfering with the Bluetooth signal (other phones, speakers, wi-fi equipment) could shorten the range or cause some playback issues. In reality, you can be as far as 50ft away from the speaker and steam any audio content without issues. The range gets shorter if there are walls, trees, cars, or other obstacles between your phone and speaker. Still, the range and connection quality are more than satisfying. If you have an NFC-enabled Android device, you can use a quick pairing feature. If you are an iPhone user, you have to pair your phone with the speaker in a traditional way – select Bluetooth as a source to initiate pairing (by pressing the source button on the speaker), enable Bluetooth on your phone, search for available Bluetooth devices, tap on Road Warrior, and you are paired. We haven’t experienced any compatibility issues – Road Warrior is compatible with both Android and Apple devices. If you have a non-Bluetooth device with a 3.5mm output, you can use that auxiliary cable that comes with the speaker and connect the audio source to the speaker via AUX input. Battery works as advertised but only at first. So, during the first couple of months, you will get approx. 12 hours at 50% volume (4-5h at full volume) but after that, the playtime will get shorter. The reason is very simple. ION uses lead-acid batteries instead of lithium-ion batteries in order to cut costs. Lead-acid batteries are inferior compared to lithium-ion batteries in every possible aspect. Among other things, lead-acid batteries have shorter lifespan. After a year or so, the battery will get unusable. Luckily, there’s a cheap solution. The battery is replaceable, and you can buy another 7Ah battery from ION for less than $20. Still, this is really inconvenient and annoying and we really expect ION to do something about this issue. Installing lithium-ion batteries will raise the price of their speakers but it will make them so much better. Most of the complaints about Road Warrior are related to battery durability. It’s actually quite ironic that a company called ION Audio doesn’t use lithium-ION batteries. We don’t have any complaints regarding the microphone (you have to buy it separately) or the FM tuner. FM antenna is rubberized and more durable than the antennas on some ION speakers we’ve reviewed in the past. The reception depends on the position of the speaker but you should be able to find at least 15-20 FM stations wherever you are. The FM frequencies are displayed on that LCD screen on the control panel. And now, the most important thing. We were both impressed and disappointed by the sound. The sound is incredibly powerful and very loud. Road Warrior is definitely one of the loudest portable Bluetooth speakers on the market (probably in the top 3). The bass is really big, it’s huge actually. But, it’s not accurate or tight. It’s pretty boomy, especially at high volumes (above 80%). Still, if you need it for outdoor parties, this kind of bass could actually sound good. Mids lack a lot of detail. Bass tends to overpower lower midrange frequencies and makes them muffled at high volumes. Some high-pitched voices sound really good but those low-pitched voices often lack clarity. Highs are surprisingly clear. Road Warrior really needs at least one midrange woofer (preferably two) and a high-quality crossover. That would make the sound so much better. But, we are supposed to evaluate the sound quality of this speaker and not to talk about some imaginary upgraded version of it. So, to conclude, this unit is incredibly loud and it delivers mind-blowing bass and clear highs. The unit performs much better outdoors and it can cover large outdoor areas which makes it a good choice for outdoor parties, tailgate parties, and other outdoor events. We don’t recommend increasing the volume above 80% because of the distortion. Distortion becomes really noticeable at 90% and it can ruin the whole experience. The speaker is more than loud enough even at 80% volume (max SPL at 80% volume is 113dB). Exos-9 is slightly more expensive than the Road Warrior. It offers much cleaner, more balanced, and more pleasant sound. It is also much smaller and more portable than Road Warrior. It has a smaller battery but it’s lithium-ion and not lead-acid battery and it delivers similar playtime. Exos-9 can be linked (daisy chained) to another Exos-9 while Road Warrior cannot be linked with another Road Warrior. On the other hand, Road Warrior is more rugged and more suitable for outdoor use, it’s louder, and delivers much stronger bass. Exos-9 doesn’t feature FM tuner and mic input. They both have USB powerbank ports. SOUNDBOKS 2 is, in almost every possible way, out of Road Warrior’s league. The only similarity between these two is the purpose. They are both party speakers designed for outdoor use. 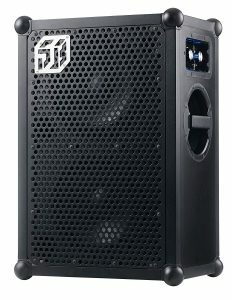 SOUNDBOKS is louder, it delivers more balanced sound (mids are much better) and the bass is even more powerful. SOUNNDBOKS battery delivers much longer playtime, it’s not a lead-acid battery, and it’s replaceable. SOUNDBOKS is also more rugged. On the other hand, Road Warrior has a mic input, FM tuner, and USB powerbank port while SOUNDBOKS 2 doesn’t have those additional features. Also, Road Warrior can be powered by your car battery (12V DC input). iPA77 is, just like Road Warrior, made by ION Audio, and they have a lot in common. They are both rugged outdoor speakers, they both have FM tuners, USB powerbank ports, AUX inputs, and mic inputs. They both have lead-acid batteries but Road Warrior’s battery is larger. Still, iPA77 delivers longer playtime because of lower power consumption. iPA77 comes with a microphone and Road Warrior doesn’t. iPA77 is also much smaller and much cheaper. On the other hand, Road Warrior is more powerful, it’s louder, and delivers much deeper and punchier bass. Also, Road Warrior has a 12V DC input and iPA77 doesn’t have one. It all comes down to your needs and your budget. 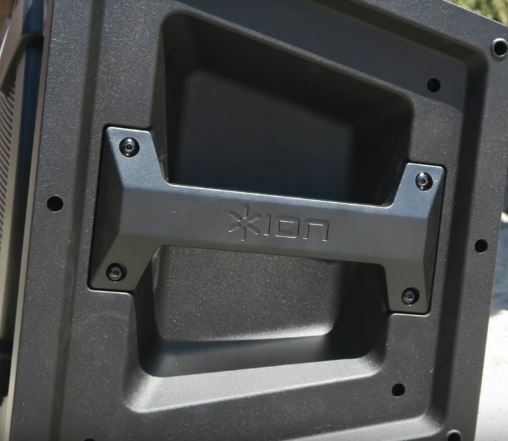 If you are looking for an outdoor Bluetooth party or tailgate speaker under $250 and if you need it to be rugged, powerful, and loud, ION Audio Road Warrior is one of the best options. If you can expand your budget a little bit more, you can always try Aiwa Exos-9. It delivers more balanced and cleaner sound with less distortion but it’s quieter and less powerful. If you can’t spend more than $200, check out iPA77 – it’s not as powerful and loud as Road Warrior but it has similar features. Our favorite is, without any doubt, SOUNDBOKS 2. It’s much better than Road Warrior in many aspects but it is also much more expensive. I am really impressed with Road Warrior speaker. I got it for a gift at the end of the year from my friend. Only one thing that is not perfect is Bluetooth connection. It works for some time and then disconnects. Which is better Audio Tailgater iPA77 or Road Warrior? 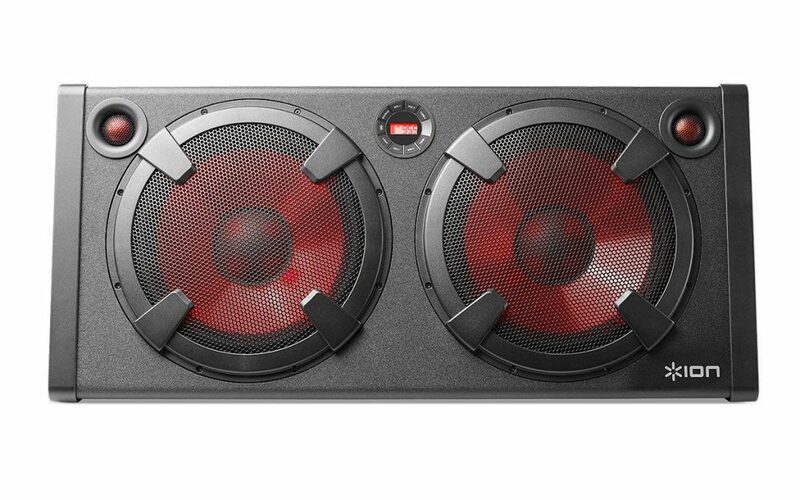 Road Warrior is larger, louder, delivers better bass, it features larger battery, and has lighted woofers. They both have the advertised range of 100ft (in Bluetooth mode) but the connections seems to be slightly better on iPA77 (it’s not a dramatic difference, but it’s noticeable). iPA77 is also significantly cheaper. Hope this answers your question.